There are countless luggage options on the market, from basic suitcases that are more utilitarian than aesthetically pleasing to modern ones with high-tech features and cutting-edge designs. And these days, it isn’t just known brands like Samsonite, Tumi and Rimowa that are dominating the market. 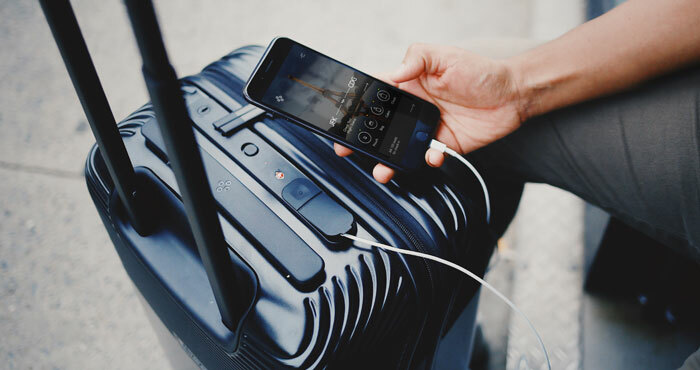 Newcomers, like Away and Trunkster, are reinventing the wheel, offering savvy travelers smarter suitcases equipped with convenience features that make traveling just a lot easier. One of the big convenience features is a built-in charger. But these days you'll need to check with your airline about their policy regarding smart suitcases. Already, lithium-ion batteries that can't be removed are banned by some countries in Asia, Africa and the Middle East, and as of last month, American Airlines, Delta and Alaska Airlines require you to remove the battery from your luggage before checking it (and according to a CNN report, United and Southwest will announce similar policies soon). The Internation Air Transport Association (IATA) has recommended a ban (pdf file), and, according to Travel & Leisure, the U.N. International Civil Aeronautics Organization (ICAO) will formally ban smart bags at the beginning of 2019. Even though airlines are currently allowing the lithium-ion battery packs in carry-on luggage, you'll need to demonstrate that you can remove the battery and will be required to power it off. So if you fly, you'll want to make sure the smart bag you buy is compliant with airline regulations. A suitcase, especially a high end one, is an investment. And while it's easy to get lured it by cool features, you should also consider other more mundane factors. Does your suitcase need to be lightweight? Do you prefer a carry-on bag or checked luggage? Do you like a hard-shell or a soft-side? Are you concerned about paying for overweight baggage? Even small details you wouldn’t think of—like having separate compartments, a laundry bag and a scratch-resistant surface—should be considered. In our research, we found five awesome options that combine functionality, style and handy extras. One of the following options is sure to fit your needs. A few years back, you'd have been hard-pressed to find a suitcase that was both functional and beautiful. Those days are long gone. Brands like Away artfully combine a sophisticated yet minimalist design with sturdiness, practicality and a few extras. 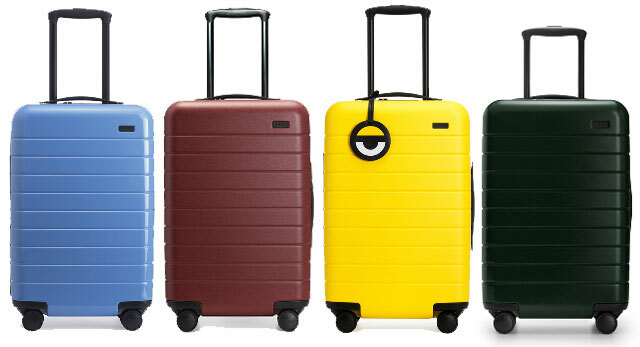 Away’s luggage line starts with the durable, supple shell made of polycarbonate plastic. It’s tough, pliable and lightweight for a hardshell suitcase (7 pounds for the carryon). It also boasts a matte finish that effectively minimizes scruff — an underrated feature that comes in handy considering the amount of beating and scraping suitcases endure today. The interiors are modest yet cleverly designed. For instance, a compression pad helps you easily buckle down your things in place and pack them in tight, giving you just a little more space when you need it. Each piece is offered in four different sizes from carry-on (21.7" x 13.7" x 9") to large (29" x 20.5" x 12.5"), plus a kids' carry-on, and comes in several stylish colors. Each suitcase is tricked out with a nylon laundry bag that you can tuck away in a small pocket when you're not using it, a TSA-approved combination lock that blends seamlessly with its elegant look, and a set of smooth-rolling and 360-degree-rotating wheels. The carry-on comes with a built-in, removable 10,000 mAh power bank with two USB ports so you can charge your devices on the go. German-made RIMOWA has been around since the 1800s, designing innovative luggage whose light weight doesn’t compromise its high quality. The tradition continues, and it’s come a long way since the company designed their first aluminum suitcase in the late 1930s. 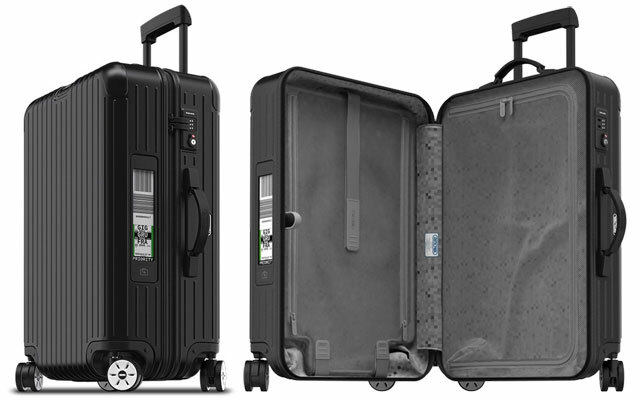 Today, RIMOWA’s Salsa Multiwheel luggage is a matte polycarbonate line that sports the brand's trademark grooved look, the universally recognized TSA lock and a multi-wheel system that lets you easily and smoothly maneuver even the largest and heaviest pieces. 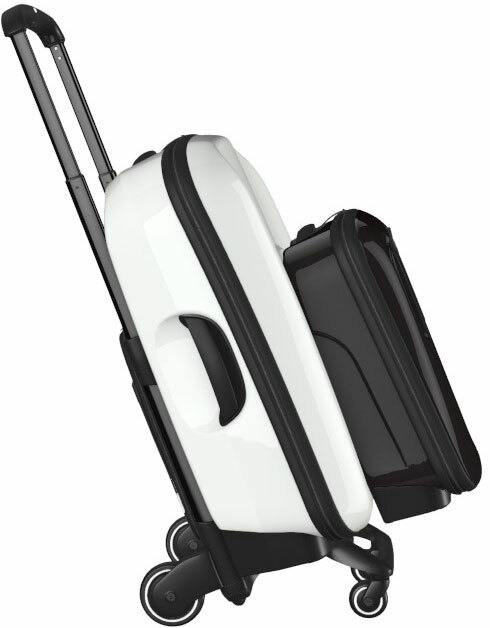 The larger checked-luggage sizes in the Salsa Multiwheel line have an electronic baggage tag built-into the side of the suitcase (powered by two AAA batteries). With the RIMOWA app, you can check your luggage, generate the luggage tag and send that tag to your case’s electronic display through Bluetooth. So now you can check your luggage anywhere that's convenient for you, without the hassle of waiting in line at the airport. At the moment, there are only four airline partners (Lufthansa, EVA Air, Swiss and Australian) that support this feature, but the list is growing. The convenience factor may soon make these bags worth their weight in gold. 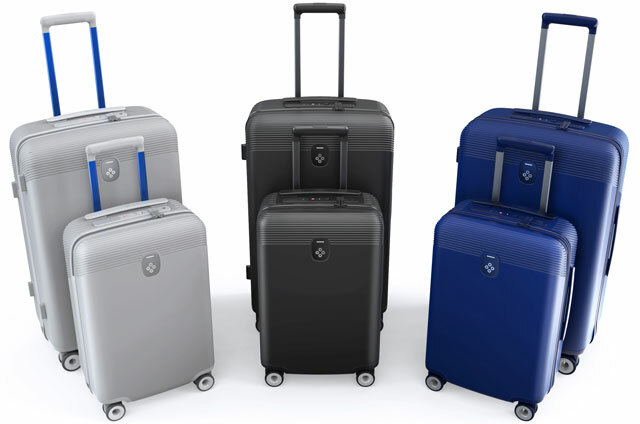 The Electronic Tag suitcases come in five colors and five sizes, the smallest being 26.4" x 17.7" x 10.2" and the largest being 32.1" x 21.7" x 10.2". Fuse the romanticism and accessibility of a wardrobe trunk with the modern suitcase’s streamlined design and easy maneuverability, and you’ve got the Trunkster carry-on. This urbane luggage shows off one-of-a-kind design along with a plethora of cutting-edge features. 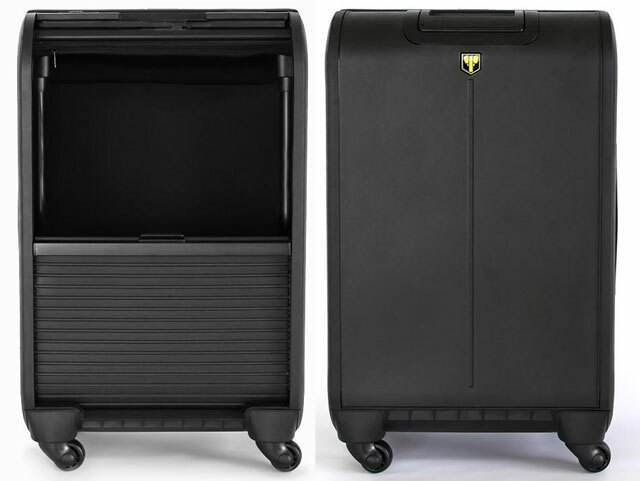 Self-proclaimed the world’s first and only rolltop suitcase, the Trunkster replaces the typical zipper entry with a sliding door on one side. This door slides down easily, giving you quick access to the contents, whether it’s a fresh shirt or your laptop. It's a smart option for frequent flyers who are expert packers and prefer to travel light and with quick access to their stuff. Though the sliding door is this suitcase’s main attraction, it boasts other cool features too. Its built-in, removable power bank has 10,400 mAh of juice and can simultaneously charge two devices at once with the two USB ports built in at the top of the suitcase. There’s also its location tracking device that lasts up to 15 days when fully charged, so you can track your luggage through the Trunkster app, and a built-in digital scale to tell you how much it weighs just in case you decide to check it or you’re traveling with an airline that has carry-on weight limits. The carryon measures 22" x 14" x 9"'. Ever wondered, as you dragged your suitcases, sore-armed, through a packed airport or on a busy street, if there’s a better way? Yes. Yes, there is. Bugaboo has leveraged years of stroller-designing expertise to come up with an elegant solution in its sleek, state-of-the-arm luggage system, the Bugaboo Boxer. The brand’s innovative Boxer system is all about steering convenience. It starts with the Chassis, which is essentially a smart-looking hand truck with stroller qualities to which you can easily attach your bags and suitcases. The Chassis is adjustable according to your height, foldable for easy storing, steerable with one hand, and effortlessly switchable from two to four wheels. Its best feature, however, is its ergonomic front-pushing capability — instead of pulling your suitcase behind you or next to you, you can push it forward like a luggage cart. The cases in the Boxer system are sold separately from the Chassis. The cases made of durable polycarbonate, are super lightweight and can be conveniently loaded, stacked, and securely fastened together on the Chassis. Each case has a removable inner bag, which can clip on to the outside of the Case, doubling your storage. The entire versatile system, which includes a laptop bag, inner bags, and trolley bags, fits together a little like a Lego set. The cases include the Cabin Case (20" x 13.5" x 7.4"), which comes in black or white, the Cabin Case Maxi (20" x 15.7" x 8.2"), which comes in black and a graphic print, and the Travel Case (30.3" x 18.9" x 10.6'), available in white. Security and mobility are the cornerstones of the suitcase system that raised $4 million in a crowdfunding campaign. The amazing Bluesmart One smart suitcase ($314 on Amazon) was a wonder when it launched. But it’s about to be dethroned by its successor, Bluesmart Two, which comes out in later in 2018. Incorporating thousands of user suggestions with the latest, state-of-the-art technologies and its predecessor’s best features, the Bluesmart Two line promises to "upgrade the way you travel" and give you the assurance of keeping your valuables as secure as possible. The system will comprise four pieces: the 29-inch Check, the 22-inch Cabin, an expandable laptop bag and a waterproof passport pouch. With its GPS+3G global location tracking, Bluetooth tracking and the new Bluesmart app, the system will not only allow you to track your luggage anywhere in the world, but also automatically lock your suitcases when you walk away and notify you when you’re leaving your laptop bag or passport pouch behind. Surpassing its competitors’ charging and weight management features. This system has a large 10,000 mAh built-in, non-removable battery pack that can be recharged in just 3 hours. And it prevents overpacking with its smart weight sensors that will tell you if you’re going over your airline’s weight allowance. All of this is combined in a fine-looking package, which makes Bluesmart Two an irresistible option for tech-savvy travelers who value convenience. It will solve many of traveling’s most common challenges, from accidentally forgetting your passport at home to overweight baggage charges, theft and lost luggage. The Cabin measures 22" x 14" x 9" and the Check measures 29" x 18" x 11". Updated on 2/1/2018 with new U.S. airline smart luggage policies.